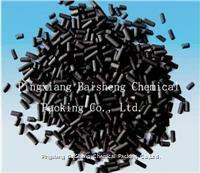 Activated Carbon 1.Professional technical 2.Usage: for water and air purification, etc. The raw materials adopted by this series are quality coals activated by hydrothermal. Cylinder coal quality carbon produced by extrusion, shatter and filtration, and unclassified breaking coal quality carbon are possible. Larger specific surface area, perfect pore construct, excellent adsorption function, high abrasive resistance, flushable and easy reproduction, etc.